Silver Colored Angel Wing (Large Size) This pretty Angel wing can be used to make Christmas Angels, Spiritual Angels, Birthday Angels. Great to use with all types of arts and crafting ideas you can come up with. Warning: Do not torch fire or kiln fire this product. ** Prices vary with amounts you order. Look at pricing in drop down menu. Many times folks want to order just one of something. Which is great for them. But keep in mind it still takes a person to fill orders and do the paper work to process and handle that one item. Not to mention the fees to Etsy and fees to Pay Pal that we pay. That is why we charge what we do for one item. Its always more cost effective for the seller and the buyer to purchase more than one. Thus the reason for the higher price on one item, and the lower prices for more than one item. Thank you for your understanding. Metal Type = Antique Copper in Color (mixed materials) Do not torch fire or kiln fire this product. 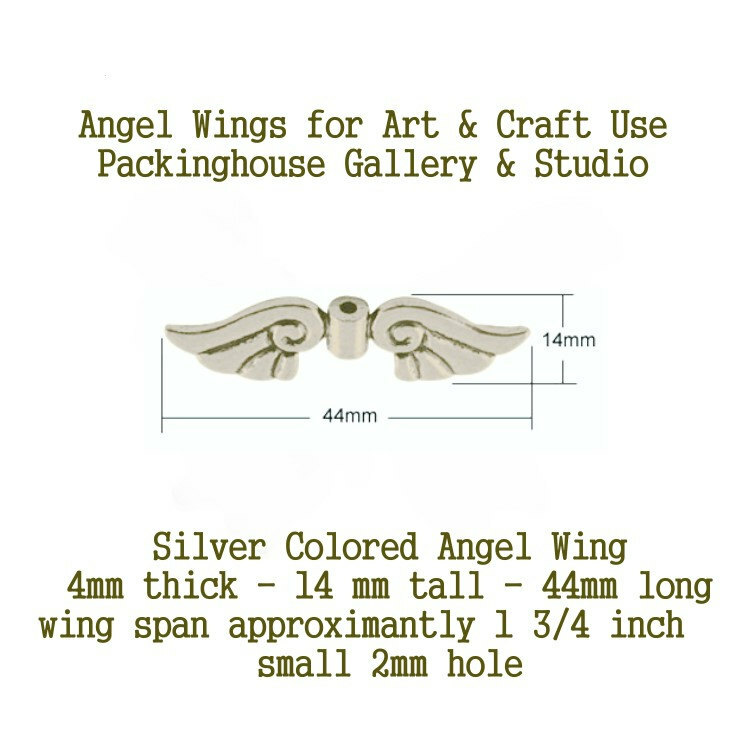 Wing Size = 4 mm thick, 14 mm tall and 44 mm wide FYI help 44 mm is approximately 1 3/4 inches long Approximately Bead Size = 44 mm long Center Hole Size: 2 mm small hole These Angel Wings can be used for ornaments, or jewelry or pretty hand made gift items. We use this Angel Wing with our Large Copper Drop to make our Christmas Angel Ornaments. All our items come from a smoke free, pet free and perfume free environment. We love show casing our customers work. If you have ordered from us and have a favorite piece using our tools or supplies, please send me a photo of your finished piece and I will highlight your work. Thank you for your business.